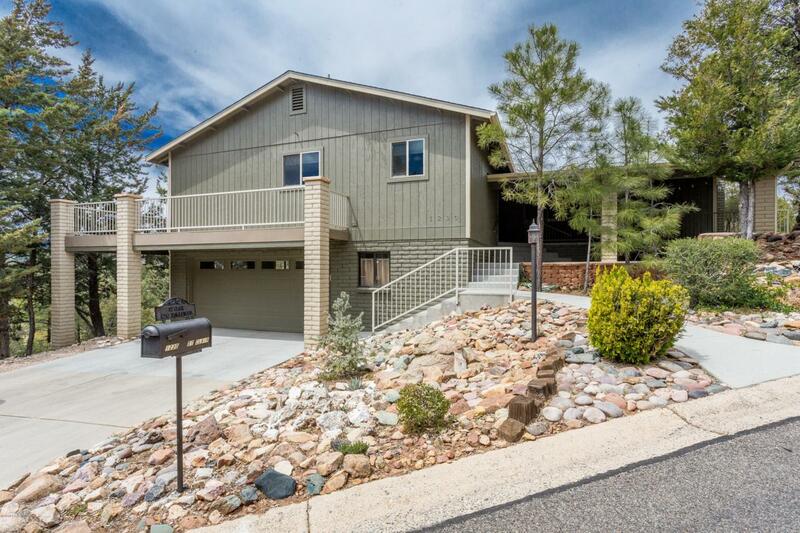 Complete/Major $160,000 Renovation of this Home (2012) in Desirable Haisley Homestead with OUTSTANDING VIEWS of Thumb Butte & National Forest of Prescott. Features 2007 Square Feet of Livable area with 3Bedrooms, 3Bathrooms, 2.5CarGarage with a GREATROOM Concept and the following UPDATES......New HVAC, New Hardwood Floors, New Carpet, New TREX Decking on Wrap Around Deck, New Windows, New Window Coverings (Pleated Shades), New Light Fixtures (Including Ceiling Fans), New 2 Tone Paint, New Knotty Alder Cabinetry w/Wine Rack, New GRANITE Countertops, New Kitchen ISLAND w/Breakfast Bar, New Stainless Steel Appliances, New Washer & Dryer, New LEDGERSTONE Chimney Face on Wood Burning Fireplace, & New 50 Gallon Hot Water Heater. Additional Amenities include a Large Pantry in Kitchen..CONTINUE:Master Bedroom on Main Floor w/Access to Deck, Single Sink on GRANITE Countertop, Walk in Shower w/Cultured Marble Surround, & Large Walk In Closet..... Bedroom #2 is Huge with Wood Burning Fireplace, & access to Large Covered Patio....Bedroom #3 is a Mini Master on lower level with Bath & Cedar Lined Closet... Garage has Storage Cabinets & Workbench & the Laundry Area on main floor is Large with Upper Cupboards. Did we mention the VIEWS and Secondary Driveway for LEVEL Entry !!!!! Yavapai County upgrade effective age 1992. Listing provided courtesy of Paul E Schneider, Pllc of Re/Max Mountain Properties.